Description: CSX Q62128 heads north past block station RICE. 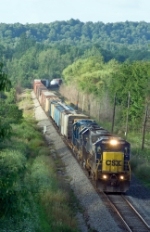 Description: CSX Q62024 heads south. 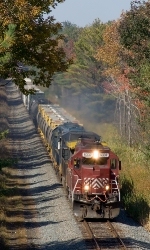 Description: CSX Q62009 heads south. Description: CSX power sits in front of the old train station while MA&N power idles by the engine house. Description: CSX B77819 heads back towards Philadelphia. Description: After working in Norwood, B787 returns to Massena light. Description: B787 heads south at BROUSE with 71 cars that will be picked up by Q620 in Norwood. Description: After being stop at CP 312 for a while, CSX Q351-02 crawls under Oakland Road with an all EMD standard cab power. 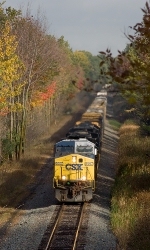 Description: CSXT 2354 as the second unit on CSX Q351-02. Description: An interesting set power is on CSX Q351-02. Title: 10:47 SB local through Patterson? Description: Could the last 4 locos of the consist been picked up at the Patterson shops?